This Washington Lien Was Late, Excessive, and Inaccurate. But It Wasn’t Frivolous! Late, excessive, inaccurate, but not frivolous: sounds like a terrible report card. Ongoing roof construction and an untimely rainstorm created quite a mess for more than a dozen condominium units. The property management company, MacPherson’s Property Management (MPM), hired Style Corporation dba Servpro (Servpro) for clean up and restoration work. Servpro brought in its drying equipment & the equipment remained in the impacted condominium units for approximately two months. When the condominium association failed to pay Servpro for its services, Servpro filed a single lien for $183,945.09. Servpro filed a single lien – not a lien on the individual impacted units. Within the lien, Servpro identified the debtor as the condo association, but the lien “applied to the 20 specific units and a common storage area where Servpro provided services.” Servpro also listed the 20 condo unit owners within the lien but did not indicate or allocate specific costs to each unit – the lien was a lump sum. It was the line held by PMP when it sought the release of Servpro’s lien: the lien is “frivolous and clearly excessive.” The court agreed and released the lien. But what kind of story would this be if it ended there? Servpro appealed the decision. 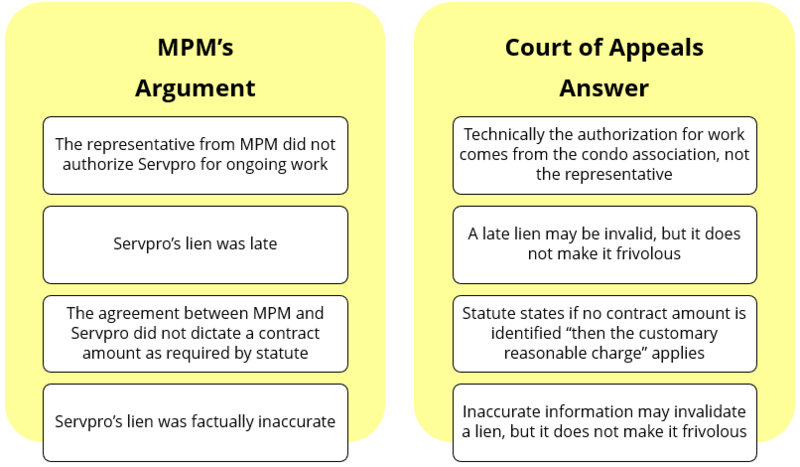 A representative from MPM provided four reasons it believed Servpro’s lien was frivolous: 1) the representative from MPM did not authorize Servpro for ongoing work 2) Servpro’s lien was filed late 3) the agreement between MPM and Servpro did not dictate a contract amount as required by statute, and 4) Servpro’s lien was factually inaccurate. Not to be outdone by the Oxford comma, the Court of Appeals also defined “clearly excessive” based on the dictionary definitions, because statute does not offer a definition. Because Servpro did not break down the total claim amount by the number of units and filed its lien as though it were against one property vs. varying units, it appeared (for this case) a lien for $18k+ was filed against one unit, which makes Servpro’s lien clearly excessive. “The trial court erred by determining that Servpro’s lien was frivolous and releasing it. Although Servpro’s lien may ultimately be invalid and unenforceable, the narrow hearing authorized by RCW 60.04.081 does not allow for release of a lien based on invalidity alone. Accordingly, we reverse the trial court’s ruling releasing the lien. What Could Servpro Have Done to Avoid this Mess? Execute a Contract. While statute provides for an interpretation of a contact amount if it isn’t included in a contract, it may have alleviated some confusion if even an estimate was included. Get the facts. Condominiums and mechanic’s liens can be a major pain. Title work can be cumbersome and expensive, but it provides critical information. If Servpro had correctly identified the property/units and allocated costs to each unit, it may have escaped the “clearly excessive” issue. File a lien on time! In Washington, the mechanic’s lien should be filed within 90 days from last furnishing. This case is on its way back to the trial court where it will likely be invalidated because of timeliness and an excessive claim, but at least we now know it wasn’t a frivolous lien.